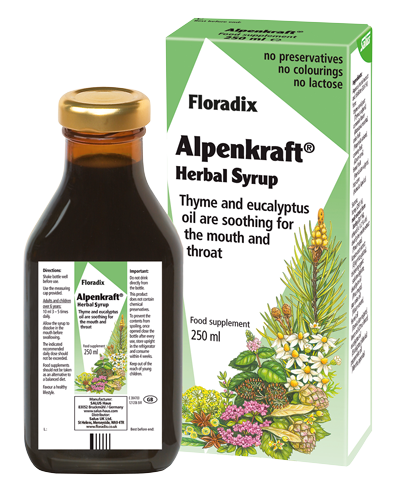 Alpenkraft Herbal Syrup may help to soothe an irritated throat or mouth due to the extracts and distillates from thyme, aniseed, fennel and the ingredient eucalyptus oil, which make it popular with singers and public speakers. It is also recommended for those people who come into contact with irritating pollutants, such as cigarette smoke, dust or industrial fumes. The naturally good flavour of Alpenkraft makes it popular amongst adults and children alike. Adults: 10ml 3-5 times daily. Allow the syrup to dissolve in the mouth before swallowing. Children from 6 to 12 years: 5ml 3–5 times daily. Available from independent health food stores, selected independent pharmacies and many online health food retailers. Aqueous herbal extract and distillate (33.4 %) from: thyme aerial part (Thymus vulgaris), camomile flower (Matricaria recutita), anise fruit (Pimpinella anisum), caraway fruit (Carum carvi), fennel fruit (Foeniculum vulgare), hop cone (Humulus lupulus). Sucrose, honey (29.1 %), malt extract from barley (3.1 %), dwarf pine needle extract (Pinus mugo), liquorice root extract (Glycyrrhiza glabra), thickening agent: sodium alginate, dwarf pine oil (Pinus mugo), star anise oil (Illicium verum), fennel oil (Foeniculum vulgare), lemon oil (Citrus limon), eucalyptus oil (Eucalyptus globulus), peppermint oil (Mentha x piperita).